The everyday charts don’t show it. Yes, the price of gold has fallen — that’s in the charts. But physical gold is still scarce. That is, it’s getting more difficult and more expensive to borrow gold. There’s not enough physical gold to meet the needs, and the rent is rising, so to speak. The numbers are small, but the trends are intriguing. The one-month gold leasing rate rose from 0.12% in early June to 0.3% in early July. That’s a 150% rate rise in one month! It’s the highest gold lease rate since 2009, although still well below the peaks of previous eras. 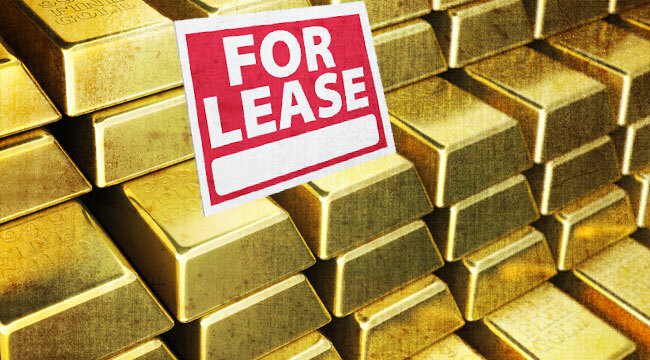 In 2008, during the stock market crash — when people sold anything that would attract a bid — one-month gold leasing rates rose as high as 2.7%. Further back in 1999, toward the end of the 1990s decade of golden doldrums, gold lease rates were an eye-popping 9.9%. Back then, it barely paid to lease gold… hold that thought. What’s going on? First, if you’re not familiar with the gold leasing market, there’s a good reason for that. You’re not supposed to know much about it. Gold leasing is a niche activity, and largely the preserve of a few big banks (Goldman Sachs, JP Morgan, etc.) and central banks. Gold leasing is virtually off-limits to retail investors. Big banks “borrow” gold — it’s what it sounds like — from physical gold holders like… oh, gee… central banks. After that, things get shadowy. Still, let’s think of “borrowing” gold as kind of like renting a car. You get a nice, clean car with a full tank of gas. You drive away, and eventually the rental agency wants its car back. With “leased” gold, the banks take the metal, but then they sell it to industrial users, or perhaps to investors who want physical delivery (unless you’re the University of Texas and want a billion dollars’ worth of the stuff). The idea is that, eventually, the gold borrower will obtain more gold from another source — let’s say a mine or gold refinery — and return gold that they borrowed from the central bank. In practice, much of the “leased” gold goes out for terms of many months, if not years. Many of those gold “leases” have been extended multiple times, up to many years. In that sense, the gold leasing model is as if you rented a car, drove off the lot and immediately sold it to somebody else. Then you paid yourself a big bonus (because you’re a banker, right? ), invested the leftover cash in other things and kept the car rental agreement rolling over for years at a time. Eventually, someday perhaps, you or your successor might return a different car to the agency. It’s bizarre, right? Yet that’s how this gold-leasing biz works. In many respects, it’s a subsidy from central banks to big banks (surprised?). It works — after a fashion — in a rising gold environment where everyone smiles, signs the papers and rolls over the contracts. But when the gold price falls? Or when the physical side dries up because… say… Asian buyers snap up gold contracts and then demand delivery? Right now, there’s a case to be made that much of the world’s “leased” gold may be on “permanent loan,” if you get my drift. Think about it. Where will the gold borrowers ever get the yellow metal that they need to return to the lenders? Thus, gold lenders and borrowers keep rolling over the leases and moving “return” dates out into the future. If you’re wondering, the gold-leasing business is likely another financial meltdown waiting to happen to any number of large banks when the lessees eventually cannot return the gold that they borrowed. For now, gold borrowers need cooperative lessors who are willing to roll over the gold loans far into the future. Meanwhile, the carrying cost is the above-noted rising gold lease interest rates. Will Scarcity Sink Gold Leasing? For the past few years, with increasing amounts of gold in investor hands (as with GLD, individual buyers and such), the gold-leasing biz has been fairly stable. Lease rates for gold found relatively low price points. But recently with gold, many former buyers have turned into sellers — at least for “paper” gold. According to bankers engaged in gold leasing, the availability of physical gold in the lending market has tightened up. This supply squeeze has triggered the above-noted sharp rise in gold leasing rates. Another way to look at it is that back in the 1990s, with low gold prices and not much volatility, the investment community didn’t foresee the price explosion that was about to occur. And recall those very high monthly lease rates for gold back in those more sober days. Now, though, we have a dramatic shift in the gold market. Many investors have recently sold gold (“paper,” mostly) en masse, triggering a 30% collapse in gold prices since the start of the year. Gold leasing markets spent nearly a decade getting used to ever-rising prices and relatively good supply availability from gold lenders or miners. Now, with falling gold prices, rising interest rates, Asian demand for physical metal and precarious mine output (recall the point about the gold price nearing the average cost per ounce), the gold leasing biz is about to get dicey. If even one large gold borrower ever has to make good on a return — as if the car agency calls and demands its vehicle back — expect a scramble for physical product, with a sharp upward price rally. Along the way, consider how tight physical supplies could trigger a bloodcurdling squeeze among funds with short positions in gold, potentially driving prices higher. It’ll be a good time to own physical gold, which I hope you’ve been buying. And the mining shares could offer huge gains as Johnny-come-lately investors pile into a beaten-down sector. The big mining guys will do well. Some of the junior development plays could utterly soar. Yes, it’s a very strange gold market. Nominal prices are down, but scarcity is up. Lease rates are up. Physical shortages are baked into the cake. Eventually, the markets will figure it all out.